Hello there! 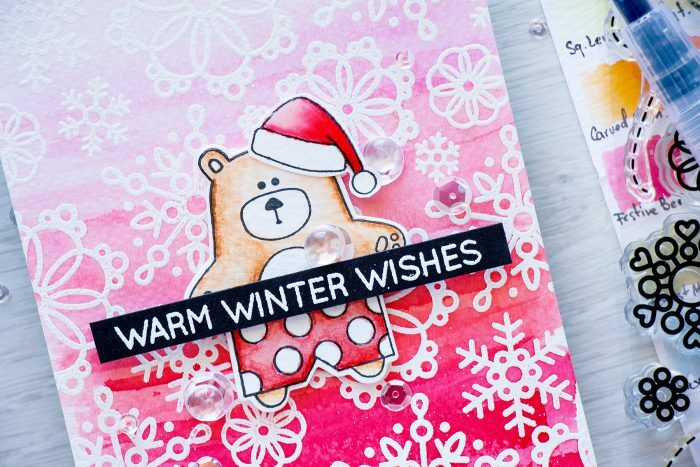 My Christmas cardmaking fewer continues and today I have yet another project to share that is all about the Holiday Season. 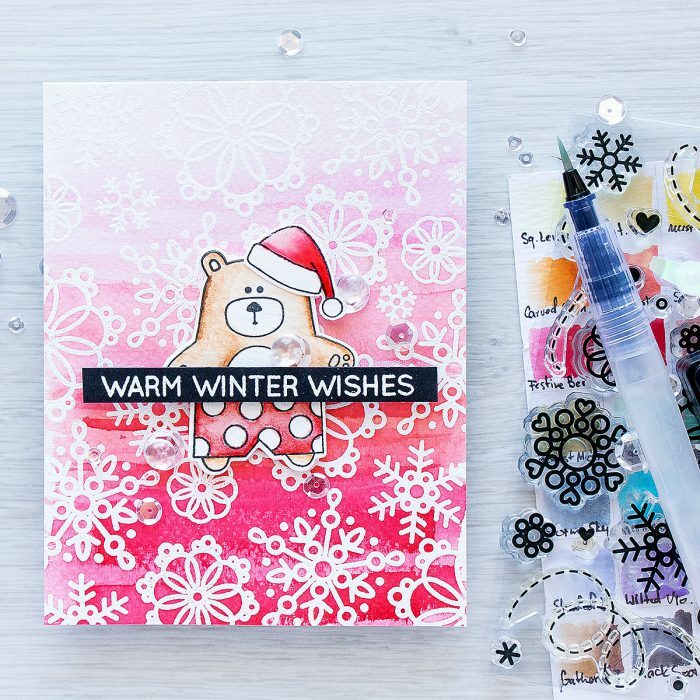 This card also features an adorable bear from the Summertime Animals stamp set. He is wearing shorts and reminds me much of the Santa from the last year’s Stamptember release (and by the way, this year’s Stamptember is just around the corner). First I created a background for my card by heat embossing a number of snowflakes from the Cute Snowflakes stamp set in white embossing powder onto watercolor paper. I used several colors of Distress inks going from Spun Sugar to Picked Raspberry, to Worn Lipstick, to Abandoned Coral and finally to Festive Berries to create an ombre watercolor wash.
My bear was stamped in Simon’s Intense Black ink using Mimi Misti and also watercolored using Distress inks. I used Tea Dye and Gathered Twigs here. He is wearing a Santa’s hat that comes from the Christmas Cats stamp set. The watercolor background was adhered onto an A2 top folding card base and the bear was foam mounted for a pop of dimension. The sentiment, Warm Winter Wishes, came from another stamp set – Ready, Set, Snow and was heat embossed in white onto black cardstock. I also added some Glossy Accents onto the shorts of my bear and adhered several clear sequins and drops from Pretty Pink Posh. Being an ex-Florida girl, I love your swim trunks wearing Santa bear. Really fun card. Such a cute card…love the coloring.